For any cancellations 48 hours prior to your wine tour departure time, we can change your wine tour to a different date or time at no additional cost, subject to availability. Alternatively, we can fully refund your wine tour, please allow up to 10 working days for the payment to process. For any cancellations within 48 hours of your tour departure time, the wine tour payment cannot be refunded. Please contact us with any changes or cancellations by either calling us on Freephone: 0508 QUEENSTOWN (0508 783 367), International Phone: +64 21 0293 7491 or email us at info@alpinewinetours.co.nz. Alpine Wine Tours is committed to protecting the environment and takes active steps to minimise the impact of our operation from start to finish. A lot of the vineyards we experience are Sustainable Winegrowing New Zealand Accredited Vineyards or are working to achieve this status. 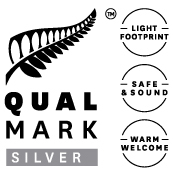 We actively strive to reduce our environmental footprint, some of the initiatives we have in place include; using only biodegradable cleaning products to wash our vehicles; training our guides in emission-reducing driving techniques and our office uses sustainable sourced paper, recycles waste, refillable ink cartridges and energy saver light bulbs.